m฿ 20 Risk-Free Welcome Offer. Withdrawals processed in 2 minutes. Rather small amount of sports. 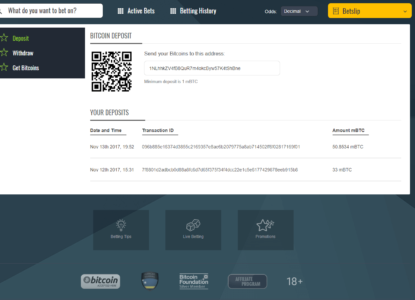 Sportsbet.io is a new and innovative bitcoin betting site. Even though they are relatively new to the industry they have already managed to make a name for themselves as a reliable sportsbook with lots of promotions. The website is owned and operated by Luckbox Ent. Ltd, which is a strong brand in the world of cryptocurrency betting. Sportsbook.io casino games and sports are operated by mBet Solutions NV, who are licensed and regulated by the Government of Curacao under the 1668/JAZ. 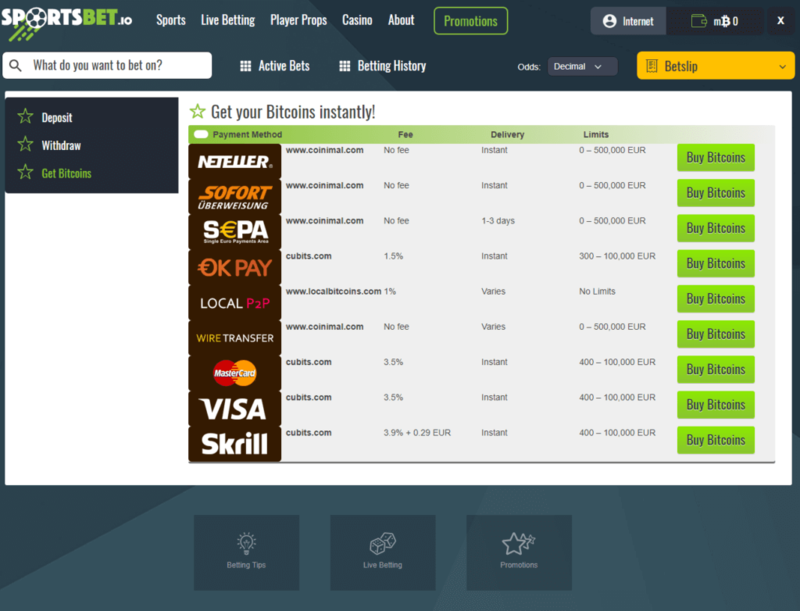 Sportsbet.io offers you some of the highest betting limits online which can range up to 100 BTC per bet, which is absolutely huge. 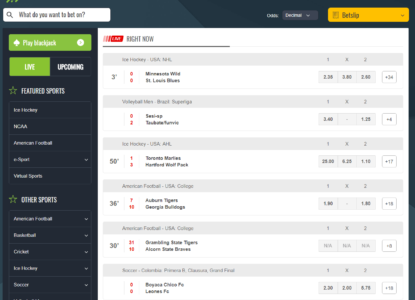 If you like using your bitcoin to bet on sports, you should definitely check out Sportsbet.io. No matter if you are looking for competitive odds, a large selection of games or amazing sportsbook promitions – they got it all. 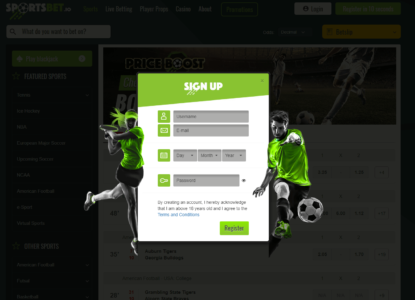 New customers signing-up with sportsbet.io will benefit from a generous welcome offer. 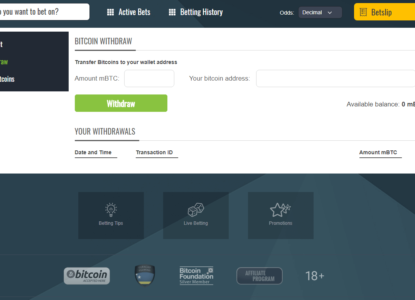 When you join the BTC sportsbook you can claim a 10 mBTC free bet. 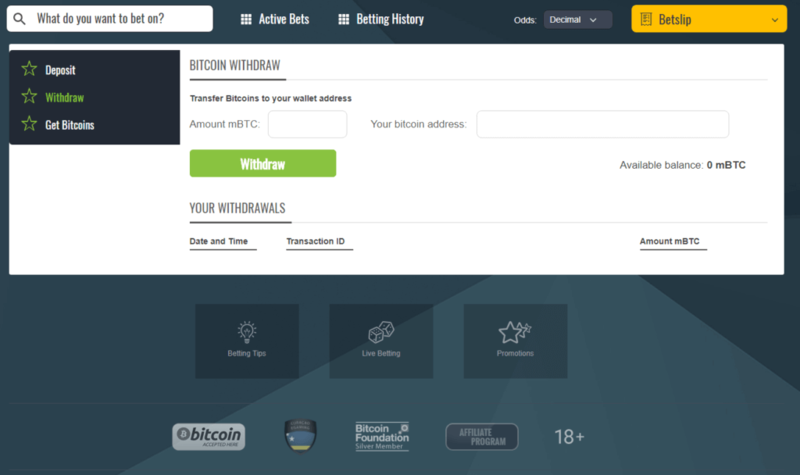 In order to claim your free bet you just have to make your first deposit and place a single pre-match bet of 10 mBTC. If this first bet loses, they will credit you with the above-mentioned free bet. You can choose between all available betting markets and there are no minimum odds required or turnover requirements. That’s actually a real free bet offer, which offers you insane value. We doubt that you will find a similar offer anywhere else. Signing-uo with Sportsbet.io is really easy and convenient. It basically takes you just a couple of seconds to create an account. Afterwards you just have to make your first deposit and you are good to go. Our following step-by-step guide will show you how to easily set up your account within a few moments and benefit from our fantastic m฿ 10 Risk-Free Welcome Offer. Please make sure to use our signup link to start the free registration process. 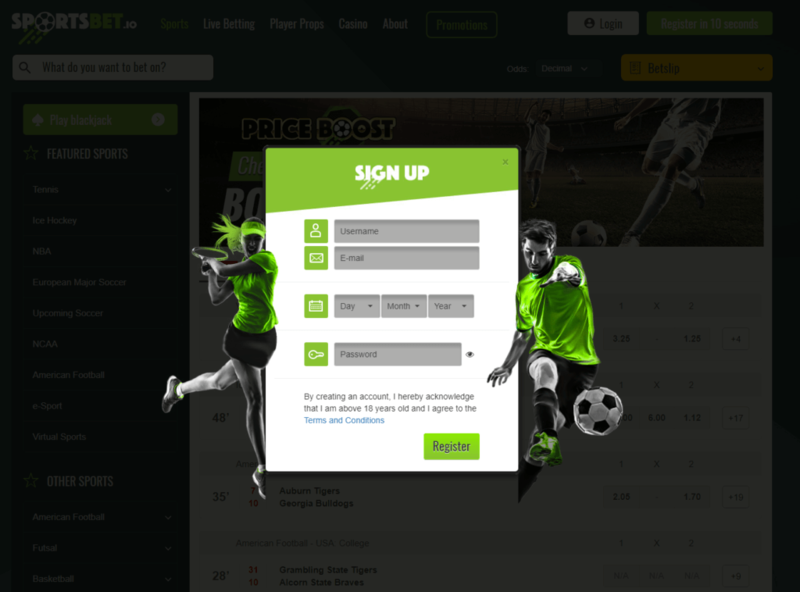 You will now be redirected to the Sportsbet.io homepage, where you just need to click the ‘Join Now’ button in the top right corner. On the following screen you need to type in the username you want to use, your e-mail adress, your date of birth and your password. That’s it – you have successfully created an account with Sportsbet.io. Once your account is created you can start to deposit your first money into your new account. 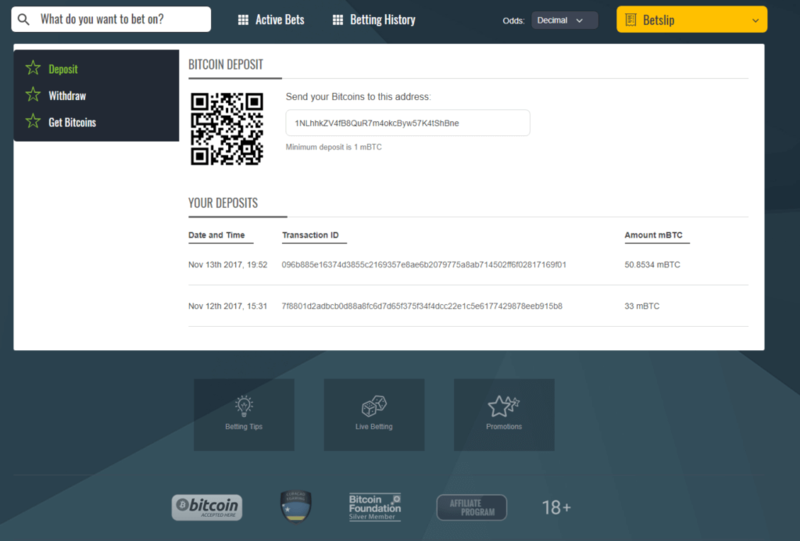 Bitcoin is the only supported way of moving funds to and from your Sportsbet.io account. In order to move funds into your account you have to send your bitcoin to the adress which is displayed in your account overivew. The bookie will create a special adress for your own account to make sure they know who made the deposit. They are not spending too much money on compliance or their financial department because Bitcoin transactions are fast, anonymous and resistant to fraud. That means Sportsbet.io can offer you basically better odds for all kinds of sports. In most cases those price boost will be offered for some major events such as Champions League matches or play-off games in the NFL or NBA. However, those offers are not limited to the major sports competitions. 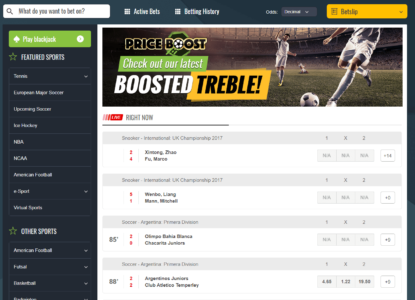 Sportsbet.io provides a large variety of price boosts for all types of sports as well. If you are looking for more enhanced odds you need to take a look at some other sportsbooks and also check our enhanced odds page, where we summarize the best and most profitable offers for you. Even if 10bet is one of the best when it comes to odds, you still should always compare before placing a bet to not miss any value. With our Odds Comparison Page, where we provide you with an overview about the best odds for different events through different sportsbooks, you can easily find the most profitable sportsbook to place your bets. Give it a try and see how easy it can be to increase and maximize your winning by just picking the best site to place your bets. 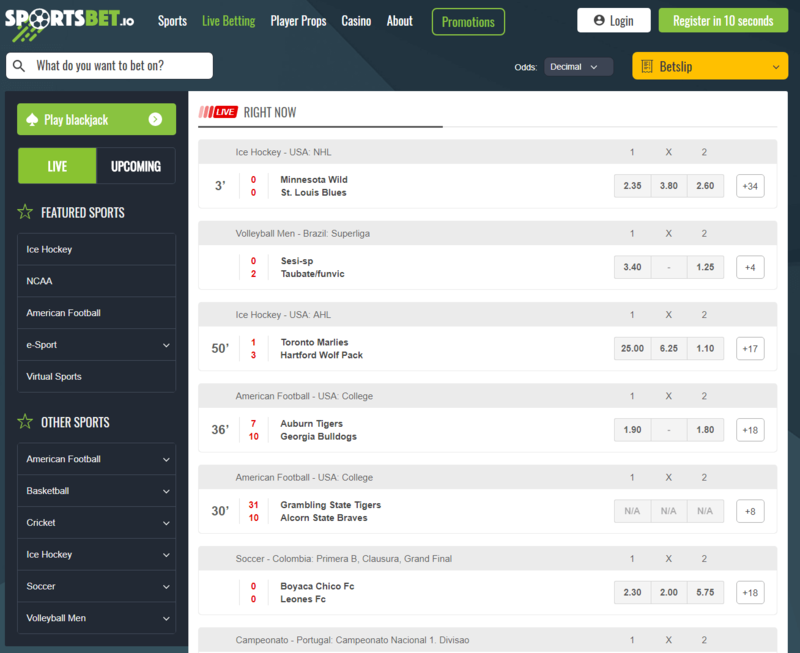 Recently, Sportsbet.io has added numerous live betting options to their site. There are some featured sports which include some of the most popular sports leagues and competitions. You can bet on various events such as Champions League matches, major European soccer leagues, U.S. sports such as NBA, NHL and more. Sportsbet.io provides you with a large amount of different live betting options like many other regular bookmakers. 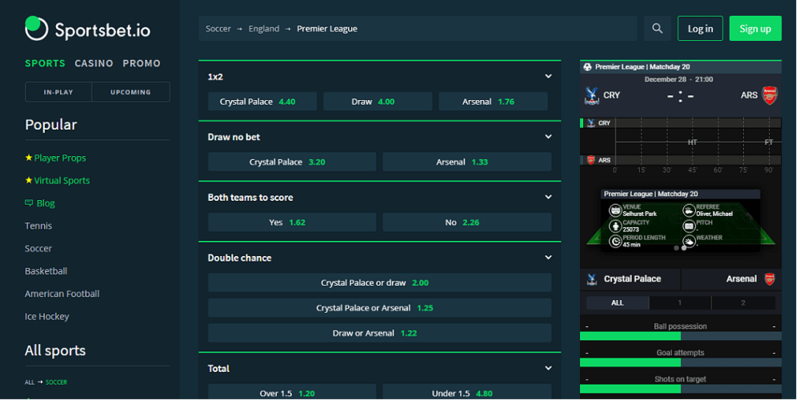 Live betting odds are updated every couple of seconds and game statistics are also shown in an overview above the betting options. The commission Sportsbet.io is charging on their live betting matches is slightly worse than their pre-match games but that’s the case for all sportsbooks. You can also use the search widget in the top left corner to find the bet you are looking for. 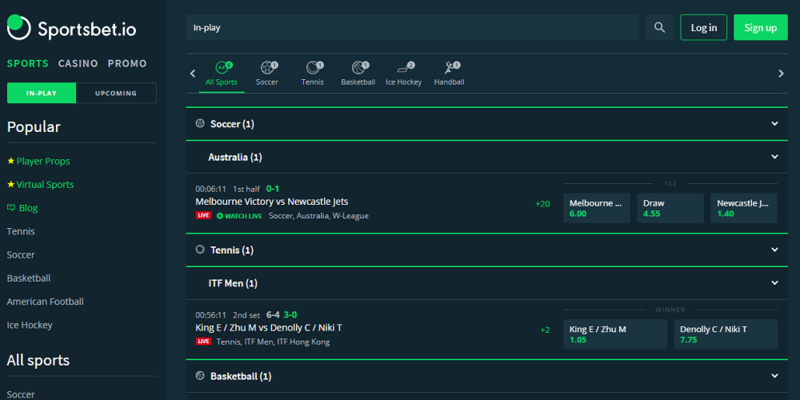 Just type in the match and Sportsbet.io will show you the upcoming games. You can also switch between decimal, American and fractional oddswhich is great if you are used to a certain type of odds format. 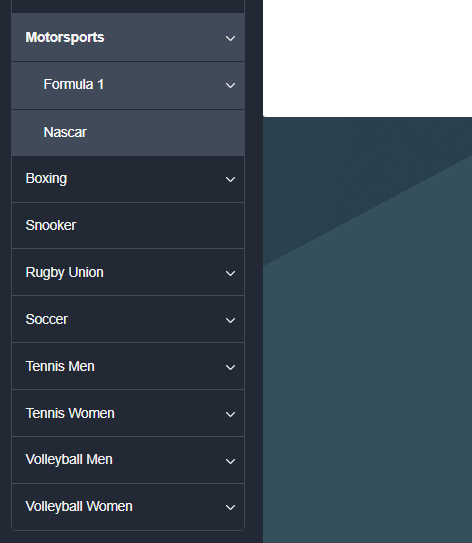 Sportsbet.io is an Bitcoin only sportsbook. That means you can only deposit and withdraw funds using Bitcoin. Transactions are anonymous, which means that you don’t have to sign-up with your real name or adress. However, the bookie insists that you confirm that you are 18 years or older. Transactions are processed automatically and it usually takes just a couple of minutes for your funds to arrive. Withdrawals are also processed automatically which is great. In most cases it will only takes a couple of moments for your funds to arrive in your wallet. Unlike other regular sportsbooks you don’t have to confirm your identity or go through KYC procedure. Sportsbet.io is just going to transfer your funds right back to you whenever you want to. 10bet is offering regular promotion for its customers and offers all betters the chance to maximize their winnings with some additional value. Check the following overview to find some of the current running promotions and make sure to check them on a regular basis to not miss any new one. 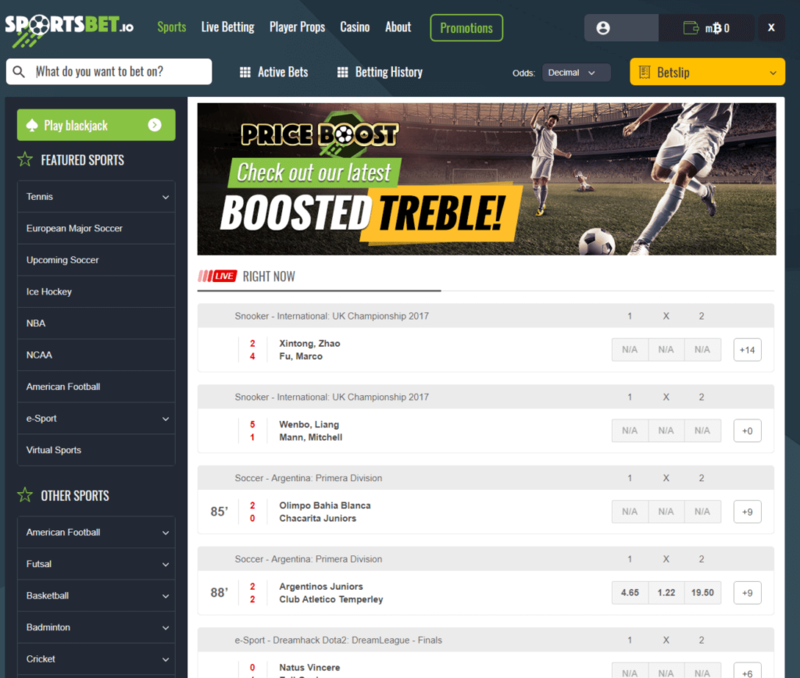 Regular Price Boost Specials – Sportsbet.io is regularely running enhanced odds offer which offer decent value. American Sports Handicap Hero! – Sportsbet.io selects a team and if it wins but fails to cover the handicap you selected (i.e. your bet is a loss), theywill refund your stake up to m฿ 20! NHL returns for the 2017/18 season! 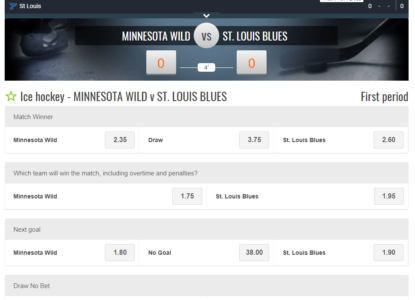 – The bookmaker is offering Shootout Moneyback offers across all NHL games. m฿ 5 Risk-Free First Player Props Bet! – Head-to-head, player-vs-player, mano-a-mano. Bet your favourite champions against each other for individual glory! Your first m฿ 5 stake is on sportsbet.io. Sportsbet.io and HellRaisers join forces – Sportsbet.io is the official sponsor of the HellRaisers CS:GO team. Benefit from a 20% ProfitBoost on all HellRaiser matches. Besides all the other benefits, there is even more value by signing up with VIP-bet. We constantly run great promotions for you and once your account is registered with us, you become automatically eligible to join. Check out those fantastic promotions and make sure to grab a piece of this free cash. 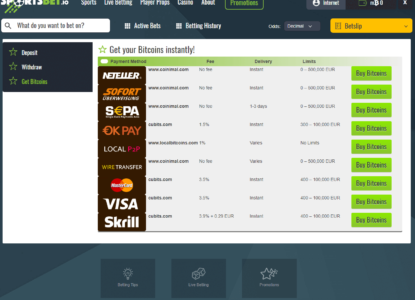 Sportsbet.io is a Bitcoin sportsbook which is also offering casino games. It is licensed and regulated by the Government of Curacao under the 1668/JAZ. a cryptocurrency service which is backed by the latest online and mobile software solutions. 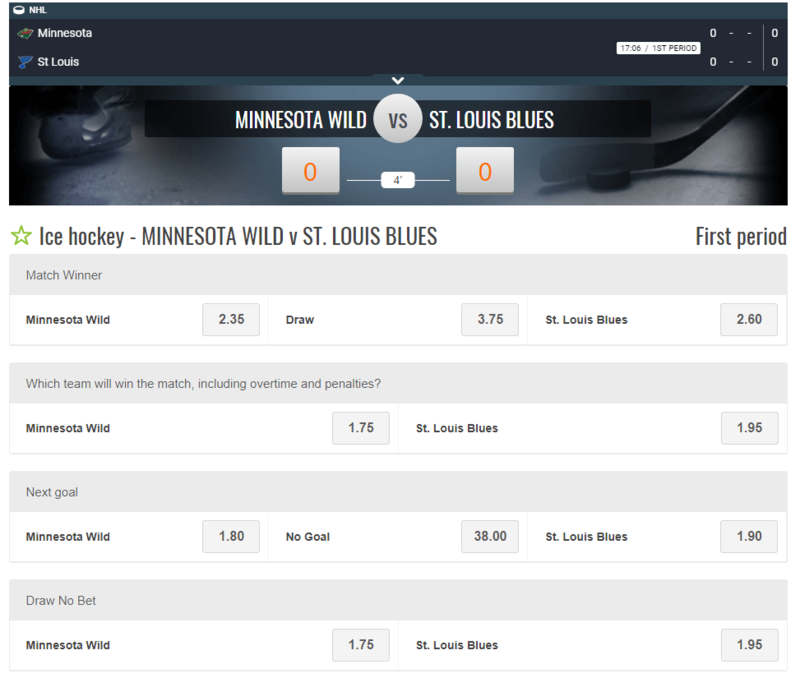 Recently, the company has also added multiple live betting options to its site. Player now can bet on all kinds of matches while they are taking place. The website also features a great live chat support which is available 24/7. If you have a question, feel free to contact them for help. Sportsbet.io is also available on mobile devices and tablets. However, they don’t have a separate mobile app, but they do offer a mobile version of their website. It can be accessed by opening m.sportsbet.io on your smartphone. The website is mobile-friendly and provides you with access to of their products such as the sportsbook, live betting and casino games. The mobile version features the same betting markets and betting options you can find in the desktop version, so you will not miss out on anything. The overall-usability is really decent, loading times are really fast and their are loads of games to bet on. The Sportsbet.io mobile version features all kinds of different bet types for major games and competitions. They have enormous amounts of different betting options for major games which can make up for more than 100 betting markets for a single game. Due to the fact that Sportsbet.io is running a mobile-friendly version of their site, you can access it from basically every mobile phone, no matter if it is a iOS or Android device. Odds Format: American, Fractional and European Odds. Live Betting: Decent amount of matches, lots of betting options. Sports & Leagues: American Football, Basketball, Badminton, Futsal, Golf, Handball, Cricket, Ice Hockey, Floorball, Motorsports, Boxing, Snooker, Rugby Union, Soccer, Tennis and Volleyball. Missing country restrictions are another huge advantage of Bitcoin betting. Due to the fact that depositing and withdrawing funds using Bitcoin is mostly anonymous you can use it from anywhere in the world. That means that you can sign-up with Sportsbet.io from any place in the world. Nevertheless we highly recommend you to make sure that online sports betting is allowed in your your country before signin-up with Sportsbet.io.